Creativity and high performance in learning processes are the main concerns of educational institutions. E-learning contributes to the creativity and performance of these institutions and reproduces a traditional learning model based primarily on knowledge transfer into more innovative models based on collaborative learning. 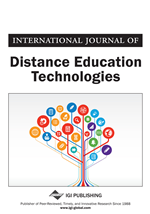 In this paper, the authors focus on the preliminary investigation of factors that influence e-learning adoption in Jordan. As a pioneer country for e-learning systems in the Middle East, an investigation has been completed for one of Jordan’s universities that has implemented e-learning. Factors are defined through the analysis of unstructured interviews with developers and users of the e-learning systems, and Leximancer content analysis software is used to analyze the interview’s content. Main factors include Internet, legislations, human factors, and Web content. The concept of the learning organization (Marsick & Watkins, 1993) has grown exponentially with the technological era. McCrea, Gay, and Bacon (2000) related that today, corporate learning and the corporate learning organization have ascended to a position of strategic prominence in the context of managing and growing the enterprise. Bachman (2000) identified the knowledge-based economy, the paradigm shift in the way education is viewed and delivered, and huge knowledge gaps as significant trends that have given rise to e-learning. The increase in complexity and velocity of the work environment brought about by technological changes are also major issues that have fueled the demand for e-learning. McCrea, Gay, and Bacon (2000) presented the shift from the industrial to the knowledge era, rapid technological change, the ever shortening product developmental cycles, lack of skilled personnel, enterprise resource planning, and migration towards value chain integration and the extended enterprise as being prominent contributors to the e-learning value chain. McCrea, Gay, and Bacon (2000) also recognized the robust economy and the increasingly competitive global business environment as central to the e-learning movement. These collected trends which contribute in driving e-learning systems and show the importance and benefits of e-learning which increases the adoption for this new technology and speedup motivation for creating a new e-learning model in Jordan. Very few researches study the adoption and use of e-learning technology in the third developing countries. It is very important to reveal that the new technology adoption might be completely different from country to country and from nation to nation. Therefore, this research investigates the factors that influence this variety in the adoption of e-learning systems. This paper begins with the definition of e-learning. The second section explains the diversity of e-learning practices in terms of persons, computer and technology literacy and social factors. The third section explains a comparison between traditional education and e-learning. In addition, the objectives, advantages and disadvantages of e-learning are outlined in this section. The term of e-learning involves using the internet as a communications medium where the instructor and students are separated by physical distance (Cooper, 1999). While “online”, “technologically-integrated”, “multimedia-based”, and “e-learning” are familiar terms that describe a new approach to instructional delivery. Studies show that faculties and universities quickly adopt these delivery modes. Analysts of this growth estimate that online learning is increasing 30-40 percent annually and that almost all higher education institutions will soon have online programs (Howell, 2003). E-learning ‘is a complement to other forms of learning and not a replacement. It should form part of an articulated approach to learning’ (Ashwin, 2005). E-learning expands the learning opportunities of students who are time limited, live in remote communities, and, or have work or family commitments or other barriers that prevent them from attending a traditional classroom learning environment (Kickul & Kickul, 2004).